Baseball was a tradition in the Aparicio family. Luis Aparicio, Sr. was considered one Venezuela's greatest shortstop and, with brother Ernesto, owned a winter league. Luis Aparicio, Jr. signed with the Chicago White Sox for $10,000 in 1955. Starting in place of another Venezuelan shortstop, Chico Carrasquel, in his rookie year, Aparicio led the American League in stolen bases (21) and was named the AL and Sporting News Rookie of the Year. For nine years in a row (1956-1964) Aparicio was the AL's top base stealer, collecting 57 in 1964. He won the Gold Glove nine times and was a ten-time All-Star. For eight consecutive seasons (1959-1966), Aparicio led all AL shortstops in fielding percentage. He teamed with second baseman Nellie Fox for many defensive gems; the pair also provided Chicago with a potent one-two punch at the top of the batting order. According to Fox: "What is the top requirement for a second baseman? A fine shortstop. I'm fortunate in having the greatest shortstop in baseball -- Luis Aparicio." Aparicio was a key part of the 1959 "Go-Go" White Sox who won the AL pennant that year. In 1963 he was traded to Baltimore, and four years later helped the Orioles reach the World Series, where they swept the Los Angeles Dodgers. Back with the Chisox in 1968, Aparicio had his best offensive season in 1970, batting .313 and scoring 86 runs. He closed out his career with three seasons as a Boston Red Sox. In 18 seasons he never played an inning at a position other than shortstop. When he retired, Aparicio was the all-time leader in games played (2,581), assists (8,016), and double plays by a Major League shortstop. He also held the AL record for putouts (4,548), and had 506 career stolen bases. Luis Aparicio, Jr. was inducted into the Hall of Fame in 1984. "That little guy is just about the greatest shortstop I've ever seen. I can't imagine how anybody could possibly be any better, no matter how far back you go." "I watched Luis Aparicio play in Caracas from the time he was a young boy. His father was one of the greatest shortstops to play in Venezuela. He was called 'Luis le Grande.' As Luis got older and played professional ball I saw that he had the talent to play in the major leagues. I was responsible for the White Sox signing him. In 1954 I called Frank Lane from Caracas and told him about Aparicio. Lane said I should bring him to the States. He was assigned to Waterloo, in Class A, and then Memphis. In 1956 he was ready to play in the big leagues. So I got traded to Cleveland to make room for him. I was happy to help him. And he was always grateful and told sportswriters about me. When I was on Cleveland I talked to him almost every day. On my first trip back to Chicago, Luis was waiting for me. He told me, 'I want to go home.' 'Why?' 'Because Income Tax took all my money.' 'Speak to the White Sox. I know they're going to help you.' 'No, no, no. I want to go home tomorrow.' 'Luis, you can't go home. You've proved to everybody that you can play in the big leagues. And it's because of you I now play in Cleveland. So you better stay here.' That's when Aparicio started to collect his salary without being taxed. The White Sox paid his tax in order to keep him in America." Despite the concentration of ex-Dodgers like Hodges and declining stars like Ashburn, the New Breed ended up devoting most of its attention to other players -- perceived as more appropriate symbols for the various flaws in the human condition the Mets brought to mind. Among them were Rod Kanehl, who could play all the infield and outfield positions, but none of them well; Choo Choo Coleman, a catcher whose main skill was chasing down passed balls; Elio Chacon, a shortstop whose lack of English extended to "I've got it" and led him into almost daily collisions with oncharging outfielders; and Al Jackson, a pitcher of genuine talent who ... in the words of Stengel, had to be relieved on occasion before 'he committed suicide on the mound.' Most of all there was Marv Throneberry, a first baseman whose feats of missing popups, ground balls, and bases became the most enduring emblem of the early Mets. The groaning laughter from the grandstands and the media failed to impress Weiss, accustomed to collecting pennants and World Series trophies from his days with the Yankees. Already irritated [that] the team had to play its first two years in the deteriorating cavern that was the Polo Grounds, he imported and exported dozens of players in the vain attempt to match the play of at least fellow-expansion Houston .... A dour man, Weiss was also slow to realize the promotional value of the sheets and placards carried to the Polo Grounds by fans bent on proclaiming their sentiments about the team; only after his confiscation policy was blasted in the press did he rescind the order and give impetus to the banners that were the become a cardinal feature of the ballpark. In their first four seasons the Mets never lost fewer than 109 games and never ended a season closer to first place than 40 games. The "instant recognition" philosophy of players continued with the purchase of all-but-done stars like Duke Snider, Yogi Berra, and Warren Spahn. Another 1963 import was Jimmy Piersall, the Fear Strikes Out center fielder who marked his 100th home run by trotting around the bases backward and who was then quickly traded because, according to Stengel, there wasn't room for two clowns on the team. For those seeking signs of an eventual improvement in the play of the club, the main source of hope was second baseman Ron Hunt and first baseman Ed Kranepool. Hunt, whose specialty was getting hit by pitched balls, finished second only to Pete Rose in the voting for the 1963 Rookie of the Year; a year later, he became the first Met elected to a starting berth in the All-Star Game .... Although he never reached 60 RBIs and closed with a lifetime batting average of .261, Kranepool spent his entire 18-year career with the Mets. The most immediate results of the team's move from the glum Polo Grounds to Shea Stadium in 1964 was a dramatic hike in attendance. After two seasons of barely missing and barely topping the one-million mark, the team reeled off annual attendance totals of 1.7, 1.7, 1.9, 1.5, and 1.7 million in its first five years in the new Queens facility. What the fans mainly got for their money were memorable games that the Mets, for all their David-versus-Goliath valor, still ended up losing. In 1964, for instance, the team observed Memorial Day by battling the Giants in a record-breaking 10-hour doubleheader that featured a 24-inning nightcap during which the Mets pulled off a triple play, San Francisco's Willie Mays was forced to play shortstop, and Gaylord Perry pitched 10 shutout innings thanks to his first big league use of a spitball. Three weeks later, on Father's Day, 27 Mets trooped to the plate and then back to the bench again as Philadelphia's Jim Bunning tossed a perfect game against them. The out-with-the-old-in-with-the-new attitude spurred by the team's shift to Shea Stadium came close to costing Stengel his position as manager for the 1965 season. After still another cellar finish, the press stepped up its quotes from the usual anonymous players accusing him of falling asleep on the bench during games and no longer even being able to identify his personnel .... Stengel's ties to the team were unraveled, then severed altogether, by two accidents during the 1965 season. In the first one, on May 10, the 74-year-old manager fractured his wrist in a fall at West Point, where the Mets had gone to play an exhibition game. The injury forced him to turn over the club, at least temporarily, to coach Wes Westrum. Then, in late July, during a banquet held to honor the former stars who would appear the following day at an old-timers' game, another fall fractured his hip ....[W]ith explicit blessings from Stengel and despite previous indications that [Yogi] Berra would be tapped as a successor, coach Wes Westrum was given a contract as the new manager. It was under Westrum in 1966 that the team avoided 100 losses for the first time and even got out of the cellar past the Cubs. Because of the improved showing, 1967 was the first season in which the hopes of the New Breed did not appear completely unrealistic. They did, however, prove groundless when the team slipped back to last place with 101 losses. The responsibility for the reversal was equally shared among the players, the manager, the front office, and the ownership -- and with important ramifications for the team that was to excite the nation only a couple of years later. In raw numbers, the 1968 accomplishments of the Mets were modest. At the end of the season, they found themselves out of the cellar and 12 games better off than in 1967, but they were still 16 games below a break-even mark. On the plus side, however, was the near-emergence of a nucleus of young players who were to make the team competitive for years to come. These included catcher Jerry Grote, shortstop Bud Harrelson, outfielder Cleon Jones, and pitchers Jerry Koosman (19 wins in 1968), Nolan Ryan, and Jim McAndrew. Most of all, there was the righthander who was to become known as The Franchise, Tom Seaver. .... [I]n May, the Mets ... obtained power-hitting first baseman Donn Clendenon from Montreal in exchange for four minor league prospects. Even with Clendenon's bat and Hodges' clear determination to make the clownish Mets of Stengel a thing of the remote past, there was little reason to think the club would mark its first year of divisional play by marching on to a World Series championship .... As it turned out, almost all the ... players had career or near-career years; the shortstop Harrelson emerged as one of the league's deftest fielders, catcher Grote shone as a defensive backstop at least the equal of Cincinnati's Johnny Bench, left fielder Jones batted .340, and center fielder Tommie Agee overcame a horrendous season in 1968 to lead the club offensively with 26 homers and 76 RBIs. But both on and off the mound, it was the pitchers -- and primarily Seaver -- who proved to be the key .... [T]he righthander [had] the first of his three Cy Young Award seasons, posting a 25-7 record and an ERA of 2.21. The drive to the East Division title remained highly improbable as late as the second week of August, when the team was still behind the first-place Cubs by 9.5 games. By winning 38 of its next 49 games, however, the club ended up with its own eight-game lead over Chicago and built the legend of the Miracle Mets. Down the stretch, omen seekers were more than satisfied by one game against the Cubs in which a black cat strolled out of the stands at Shea Stadium and scampered over to vex Chicago manager Leo Durocher, and by another game in which St. Louis ace Steve Carlton struck out a record 19 batters -- but still lost to the Mets on two home runs by right fielder Ron Swoboda. Another turning point, according to many of the Mets themselves, was a midseason game in which Hodges called time to take a long stroll out to left field and order Jones to accompany him back to the dugout for being less than energetic in his defensive play. In their first taste of postseason competition, the Mets resorted to hitting rather than pitching to sweep the Braves in the League Championship Series. In the World Series against heavily favored Baltimore, they fell back on pitching, the timely slugging of Clendenon and second baseman Al Weis, and the spectacular outfield defense of Agee and Swoboda to win four out of five against the Orioles. New York was the first expansion team to take a world championship, and would continue to stand alone in that category until the Kansas City Royals defeated the Cardinals 16 years later. By the winter of 1988, the eight-story building in Boston's Kenmore Square, on the corner of Kenmore Street and Commonwealth Avenue, housed a bank, offices, and apartments for the elderly. 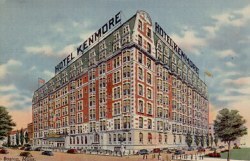 In an earlier incarantion, 490 Commonwealth Avenue was the Hotel Kenmore, the hub of Boston baseball. Opened in spring 1926, the elegantly appointed hostelry eventually became headquarters for all fourteen teams that came to visit the Red Sox and Braves. It became known as the "Baseball Hotel" and catered to the special needs of the boys of summer. "Baseball players are wonderful guests," assistant manager Everett Kerr said in the summer of 1952. "But they can be superstitious. And they're moody." Hired help was required to know the game thoroughly. Front-desk clerks had to be able to recognize and accommodate, say, Connie Mack if he showed up without a reservation. Bellhops and coffee-shop waitresses had to know who was in a slump in order to tiptoe around them. The staff was encouraged to listen to ball games over the radio as they worked. After night games, the kitchen stayed open until 2:00 A.M. so the boys could grab a bite to eat before bed. Extra-long beds were supplied to taller players, such as Hank Greenberg and Ralph Kiner. Bathrooms were equipped with showerheads just like the ones in the ballpark clubhouses. The place was rich with baseball lore. In the grille, Giants manager Leo Durocher had a lucky booth, the one he occupied while listening to the Dodgers lose a crucial game en route to the 1951 one-game playoff. When the Indians beat the Red Sox in the 1948 playoff, Cleveland owner Bill Veeck threw a party at the Kenmore that legend says lasted two days. Brooklyn shortstop Pee Wee Reese spent hours on Commonwealth Avenue feeding sugar cubes to the mounted policeman's horse. At one sitting in the dining room, Cardinals slugger Stan Musial consumed six lobsters. Joe McCarthy quit as Yankees manager, Bill Dickey was fired as Yankees manager, and shortstop Rabbit Maranville retired from the Braves at the Kenmore. In the lobby in the spring of 1947, Detroit catcher Birdie Tebbetts was traded to the Red Sox for catcher Hal Wagner. House detectives were routinely stationed outside the room of a player known to fall asleep while smoking cigars. In the spring of 1943, Casey Stengel walked out of the Kenmore at 2:00 A.M. and was hit by a cab. When the Braves left Boston for Milwaukee before the 1953 season, the Kenmore's baseball business was halved. In the spring of 1965, the hotel was closed and the building was sold. From the rooftop boxes at Fenway Park in 1991, fans can look up from the ball game, see the old hotel's mansard roof and dormer windows, and wonder about the old ballplayers who used to throw them open in the morning, breathe in deep, and look forward to a coffee-shop breakfast and a ball game. It was a pitchers battle from start to finish, with honors about equally divided between Donovan and Willis, although the Brooklyn star allowed fewer hits than the tall, slim young man who had dished up a remarkable assortment of curves for Boston during a number of years. The visitors got one run off Donovan in the first, and as the game progressed ... that single run assumed huge proportions. Not until the sixth did the locals get a man as far as second base. In fact, not until then did the Brooklyns have even the slightest chance to score. In that inning three men were left on the bases, and the hopes of tieing [sic] were apparently dashed to earth for good. But the strain told on the Bostons ... and in the seventh a couple of errors in succession by Long, added to Daly's splendid base running and a timely single from the bat of Lefty Davis brought in the run that placed the teams on even terms. The ninth saw the tables turned drastically .... Dahlen, who had been robbed of two good hits by the phenomenal fielding of Billy Hamilton early in the struggle, opened the inning with a two-bagger to left, went to third on a well-timed sacrifice by McGuire and scored the winning run when Donovan smashed out a hot drive that caromed safely off Willis' almost invisible anatomy. There was an afterpiece to the game that added zest to the show .... 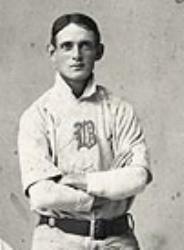 The Boston players had kicked hard on several occasions against decisions by Umpire Colgan, particularly in the ninth, when he called Lowe out at second on a steal, and they made several unpleasant remarks as the official wended his way into the grand stand. Several of the bleacherites began the demonstration by jumping into the field and calling the umpire "robber," and the visiting players took the cue. "Home umpire, home umpire!" shouted Captain Long as he walked across the field, intimating that Colgan favored the Brooklyns. "You ain't got sand enough to stand up and take your medicine," chimed in Billy Hamilton, who had had frequent arguments with Colgan over strikes. And yet Colgan was impartial in his distribution of bad decisions, for he gave the home team as rough a deal as he administered to the visitors .... Donovan was surely safe at first in the sixth, he beating out a hit to Long which the latter fumbled. Had Colgan seen the play properly the game would have been won then and there, for Keeler eventually reached first on Tenney's fumble, Sheckard hit safely to right and Kelley got a free pass which, with McCreery's fly to Hamilton, would have brought in at least two runs. Donovan was very much in the game. He not only brought in the winning run with a timely hit, but worked himself into fame by pitching remarkable ball. Only five hits were made off his delivery, which was up to McGinnity's form of last year, while he placed six strikeouts to his credit, three of them in one inning. ....Dahlen was again in evidence with six good plays .... McGuire caught well, beside nailing two ambitious base runners, and Keeler and McCreery divided the honors in the outfield. Kelley also gave a splendid exhibition at first. For Boston, Hamilton easily walked away with the star achievements of the day. He very nearly equaled McCreery's record on Monday, making seven put-outs. Two of them, both off Dahlen, were remarkable .... [One] was a clean line drive straight toward the center field fence. Billy had to run full tilt at right angles and grabbed the ball on the jump. Against any other fielder the hit would have been good for a homer.